We believe in the value of physical fitness and we provide our students many opportunities to engage in and to enjoy fitness promoting activities. For eight week periods, students receive coaching and instruction in a variety of sports, including T-ball, soccer, basketball, field hockey, flag football, and even four-square. Each sports programs includes specific skills instruction, team play, and a tournament. On the unlikely rainy days, participants are given classroom instruction. Kids are also given a logo tee shirt, and each eight-week program culminates in a final Saturday game that is followed by an awards party. Parents are encouraged to participate with their children in the final event and they always have had a lot of fun doing it! Mt. 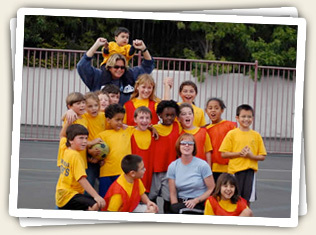 Helix Academy’s Intramural Sports program is co-educational and for students in all grades.